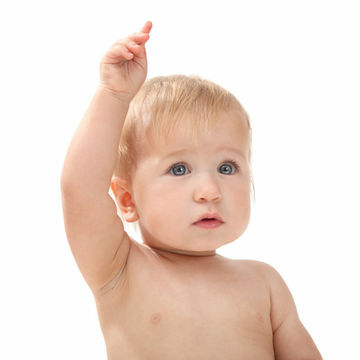 Start Young: Six or 7 months is a good age to introduce your baby to sign language—by then, she'll have the dexterity and understanding to begin using signs effectively, says Barbara Granoff, an infant/toddler sign language instructor in Newport Beach, Calif., and co-creator of the Sign-A-Lot DVD series. Find Teachable Moments: Starting with basics like eat, more and all done, make sign language interactive by introducing signs during meals and story time, suggests Granoff. When you feed your daughter pieces of banana, make the sign for the fruit. As you're reading her a book, point at a bear or a butterfly and sign those words as you say them out loud. Locate Resources You can either take an adult American Sign Language workshop; learn signs via flashcards, books, or DVDs such as Sign With Your Baby (Northlight Communications); or register for a parent-child class and learn together. Many communities now offer classes, or you can go to sign2me.com to find a local instructor. Relax About Speech Development "Parents worry that teaching sign language may delay speech, but research shows the opposite," Granoff says.